MADRID, Spain (April 14, 2005) – Korea won two gold medals on the second day of the 2005 WTF World Taekwondo Championships here today. China and Brazil clinched one gold medal each. In the men´s under 58kg category final, Korea´s Ko Seok-hwa outpointed Iranian Khodadad Behrad 8-7 to grab the gold medal. The bronze in the division went to Vietnam´s Thanh Long Dinh and Sutthikunkarn Dech of Thailand. Another Korean Oh Seon-taek defeated Spain´s Garcia Jon 5-3 in the men´s under 84kg class final contest to earn his country the second gold medal at the 17th World Taekwondo Championships. In the same category, Iran´s Karami Yossef and France´s Ntep Bruno won the bronze medal each. About 1,700 athletes and officials from a record 125 countries are attending the championships, which continues through Sunday. In the women´s under 51kg class final, China´s Wang Yang clinched the gold medal as she defeated Spain´s Yague Brigitte 2-1. The bronze went to Australian Lukic Nevena and Cuba´s Montejo Daynelli. Brazil´s Falavigna Natalia brushed aside a stiff challenge from Britain´s Stevenson Sarah to earn her country the first gold medal at the World Championships. 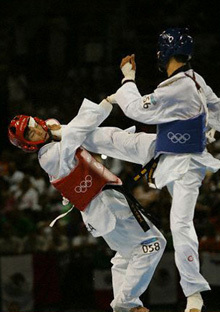 The gold medal in the same division went to Spain´s Los Arcos Aitziber and Korea´s Jung Sun-young.